Hi kids! My name is Simon the Safety Bloodhound. Do you know what to do if you get lost? I'm visiting libraries around the county to spread an important safety message: if you get lost, "Don't Run Around, Stay Found." That's right, stay put! 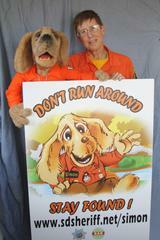 My pal, Pam Medhurst from Sheriff's Search and Rescue (SAR), will be helping me during the library visits. We'll share who you could ask for help and how you can avoid getting lost in the first place. At the end of the presentation, you'll get free stickers and other giveaways. You'll also meet a Search and Rescue Beagle. If you can't make it to this "Don't Run Around, Stay Found" presentation, I invite you to visit my website for safety videos. You can also send me an e-mail. 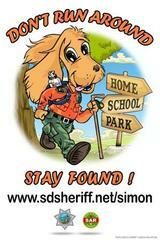 Just go to: www.sdsheriff.net/simon.